The Book Rat: Interview: Christopher Healy, author of The Hero's Guide to Saving Your Kingdom! 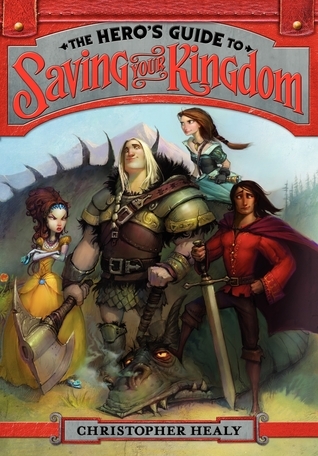 Interview: Christopher Healy, author of The Hero's Guide to Saving Your Kingdom! Enjoy the interview, leave Chris some love, and make sure to keep an eye out for a special prize pack that includes a copy of The Hero's Guide to Saving Your Kingdom, as well as my review in May as part of the blog tour! Oh, and when you're done watching the video, maybe you want to check out the excerpt I posted from Hero's Guide, complete with an exclusive sneak peek at the fabulous artwork! Oh and the chair? I feel for you Mr. Healy, my cat does the same exact thing to mine. That was an awesome Video! Those were some tough questions but really interesting one! I loved the answers and I am so excited that there will be a sequel. I wrote on Ashley's blog that I hoped there would be a sequel!